At 55,000km on the odometer, my 4-year old Pulsar was due for an oil change. So after returning from a short Sunday morning ride to JB, I went to LAB and got myself some Motul 7100 15W50. Changing engine oil is a relatively simple maintenance procedure, and I’ve almost always been doing it myself. But today’s oil change was anything but typical. For those who have been following my blog, you’d probably know that I experienced an engine breakdown due to a catastrophic camshaft bearing failure less than 1 year ago. In fact, I was almost stranded in Chiang Mai, Thailand, some 2,500km away from home where there wasn’t any Bajaj dealership in the country at all. I had to FedEx the engine parts up from Singapore to get the bike fixed. Similarly back then, the magnetic oil strainer caught a massive amount of metal shavings from the grounded down camshaft bearing. Thankfully, this time around, I caught the problem early and it didn’t (or rather, HAVEN’T) lead to an engine failure. The bike was still ride-able, but definitely extremely concerning. The top part of the engine (from the piston and cylinder block upwards) were mostly replaced at the last teardown. The engine also sounded like it was purring along nicely, and so I suspected that the failure this time might be due to the gearbox or the lower part of the engine. And so I sent it in to Universal Motors on Monday for the mechanics there to diagnose. Bad news – an engine teardown (again) was necessary to ascertain the extent of damage and the offending component. 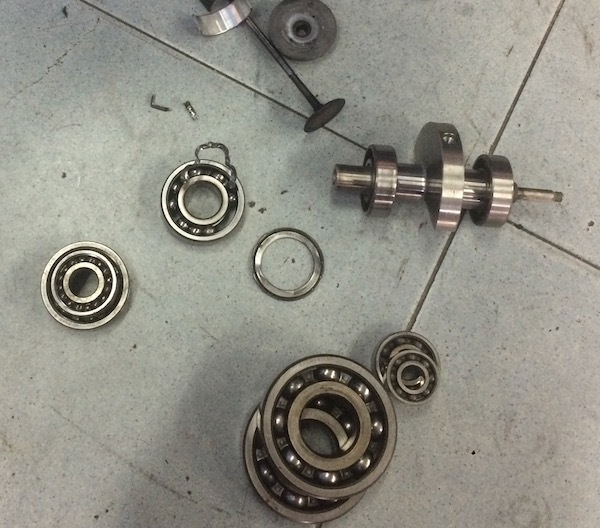 After a complete teardown of the engine, the lead mechanic, Ah Tek, found the offending component – it was the output shaft bearing that was failing. The failing output shaft bearing assembly was pried open to visually inspect the grounded-up bearings. 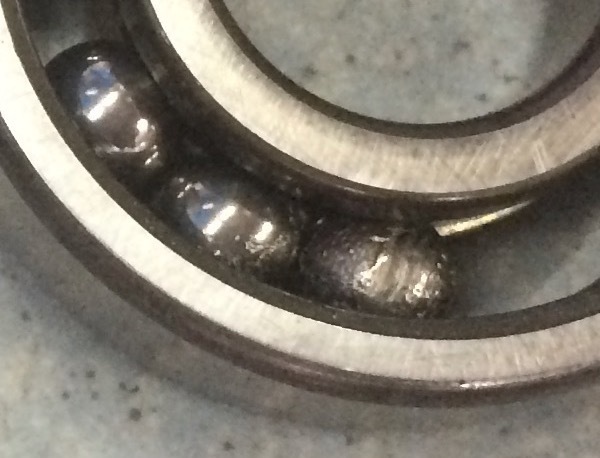 When the ball in a ball bearing is no longer a smooth metal ball, it’s bad news. And since the engine was opened up, and at the recommendation of Ah Tek, I took the opportunity to replace many of the other bearings and stuff – including the timing chain, valves and camshaft bearings that was replaced just a year and 22,000km ago. Some of the other bearings that was replaced, along with the balancer assembly. Bajaj quality. This is disappointing… So very disappointing. How much did u get the 7100 oil at LAB? How much did u get the 7100 oil from LAB? Oh my this is worrying. Wonder if this is a recurring problem on other bikes too. Or perhaps it’s just down to my arse luck. Wow just 22k kms travelled! Happened Again? It’s not like you’ve been thrashing or rempit,am i right? Damage even though using motul full syn. Very sorry to hear this. Actually, the output shaft bearing wasn’t replaced at the previous engine overhaul. Ohh I see… the strainer definitely did its job. Hopefully no more trouble after this. Dude, same issue here man. Weird sound from my engine and found out my bearings were gone after 2ok+-. Total damage 180sgd. Change engine bearings and shaft bearings too. I use motul 7100 btw, its just disappointing..
Aww… disappointing indeed. 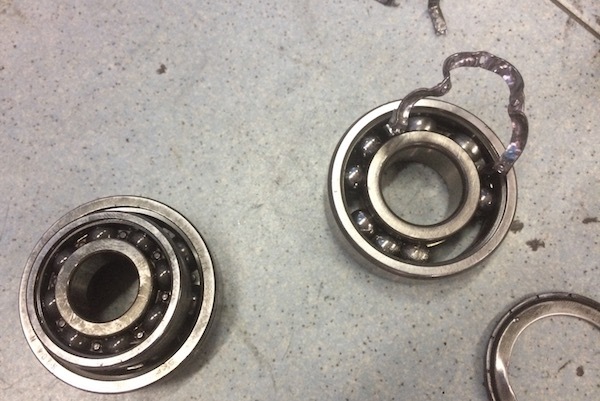 Which bearing was it? Camshaft bearings, hopefully it will last.. lol. My mileage is giving me 33km/L too. Oh shootz! Seem like the camshaft bearings on the 200NS ain’t too hardy! I also have a NS200 (Abit a 2015 one and FI), reaching 19K in mileage, I also am finding some weird whine on my bike not too long after a recent oil change (Liquimoly 20W-50). would it be wise to send it in to UM for a check? Yeah – send it in. Before the issue gets worse and lead to more (expensive) damages. look like there is nothing wrong with the engine oil and the maintenance of the bike. Most probably some joker in the product assembly line did not followed the right procedure to install the bearings during assembly of the bike. Look like there is nothing wrong with the engine oil or the maintenance of the bike. Most probably some joker in the product assembly line did not followed the right procedure to install the bearings during assembly of the bike. And too bad we can’t see during purchase but it breakdown after period of time. Not sure. Doubt I’ll ever get to find out. Would you recommend this Bajaj Pulsar NS200 to a new 2b rider after owning it for almost 2yrs? Despite the (ups and) downs which I’ve occasionally encountered, I’ll still wholeheartedly recommend it. I personally like the looks of it, although that’s a very personal thing. But the performance / price ratio is pretty amazing. Yes, some workshops here may lament that it’s “difficult to get parts”. But I always had no issues getting parts from Universal Motors – the sole distributor of Bajar parts here. In any case, it’s probably the most powerful under 200cc bike you can find in Singapore at this price point. Its looks and price/performance ratio is really tempting (between Honda CB190R and Pulsar NS200). Personally, I love the looks of the CB190R too. But just take a look at the engine specs. Being air-cooled, it’s max HP is pretty capped. Even the CBR150R has higher HP.